With the end-of-year holidays approaching, this Russian-French version of gravalax makes a fine festive dish. The salmon is marinated overnight in salt and sugar — et voilà, it’s ready. Although I enjoyed this dish many times while working in Russia, where it is known simply as riba salyonnaya, or salted fish, I only started making it in Paris thanks to a Russian friend who passed along her family recipe. Served with shots of vodka or flutes of Champagne, it will get your holiday meals off to a spectacular start. The key to success with this recipe is to use very fresh fish. 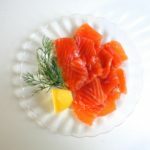 The first time I attempted it, the fishmonger didn’t have salmon, but he did have a very large, very fresh sea trout — which would also work fine, I’d been told. I had him fillet the trout. As I was leaving, he asked, “But wouldn’t you like to take the roe too?” Why not? I thought, figuring I could experiment and try to make trout caviar. As soon as I got home, I reached for my old-style Russian-language cookbook and flipped excitedly to the page for caviar. “To separate the roe from the membrane,” the recipe said, “first gather a couple handfuls of snow.” Oops. End of experiment. But the fish — ah, the fish. Almost sinfully succulent. Happy cooking! This entry was posted in 1. Starters, 5. Fish and Shellfish and tagged gravalax, marinated salmon, recette, recipe, saumon mariné. Bookmark the permalink.